Outside the wind chill is five below zero, but inside this trendy Upper East Side club, the jam’s so hot, it’s smokin’. The crowd has made its way from the canyons of Wall Street, the brownstones of the West Side, the bedroom communities of Westchester, and some from just across the street. 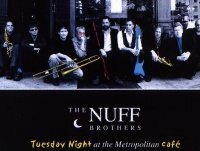 It’s the usual array of party animals, pumped from the corporate conquests of the day, all packed in to get their fix of the Nuff Brothers and the band’s exuberant mix of R&B. But take a closer look around the room, and you’ll notice an inordinate number of instrument cases, stowed under tables or stacked up against walls. Because this band is comprised of musicians’ musicians. The Nuff Brothers are the guys the other players come to hear. Individually, they’ve played with everyone from Aretha Franklin to Frank Sinatra. From Dr. John to John Lennon. From Eric Clapton to Mariah Carey. From Sting to Paul Simon to Carly Simon. From Tony Bennett to Todd Rundgren, from James Taylor to Taylor Dane, from Bette Midler to the Blues Brothers, from Steely Dan to the New York Philharmonic. Each one is a virtuoso, fully capable of playing any genre, any style. But when they become the Nuff Brothers, they take it to the next level. Because it’s not just a band, it’s a labor of love. The rhythm section gives new meaning to the word, “powerhouse,” with Keith Carlock on drums, Kenny Ascher on keyboards, Stu Woods on bass and David Spinozza on guitar. New York’s premier horn section – Blues Brothers, Lou “Blue Lou” Marini on tenor, Alan “Mr. Fabulous” Rubin on trumpet and Birch “Slide” Johnson on trombone, plus Lawrence Feldman on sax – adds sizzle to the contemporary charts penned by Marini and other band members. And don’t be fooled by the wild Irish tenor looks of Tommy “Pipes” McDonnell – when he opens his mouth to sing, what emerges is pure, unadulterated soul. So pull up a bar stool and just try to sit still, an impossibility when this band lets loose. It’s a night with the Nuff’s. It’s screamin’.